The Yangtze River, which passes through Hunan, once helped make the province an important communications centre. The Imperial Highway also ran through Hunan, connecting north China to south China. In the past Hunan fed much of China due to its abundant grain harvests, and it is still a leading rice-growing province. 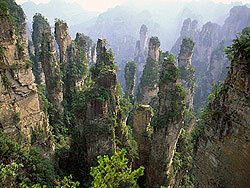 Hunan has numerous places of interest. It was the home province of the founder of the People’s Republic of China. Mao’s home village, and the residence he was born and grew up in, are open for public viewing. Another must-see is the World Heritage Site of Wulingyuan, a beautiful collection of over 3,000 towering quartzite sandstone pillars, almost 800 metres high. Hunan’s craftsmen are admired for their artistic skills; the province’s talented craftsmen and women create top-of-the-line luxurious silks and intricately carved jade. Do not leave Hunan without savouring its cuisine, especially if you love spicy food!